Athens psych-infused country rock outfit Futurebirds have been a group we’ve loved keeping an eye on for years, growing from a buzzy hometown fixture to a band with international acclaim, who’ve logged countless tour dates, appeared at numerous top festivals, and, across three LPs, a live album, and four EPs, have consistently churned out well-received efforts, perfecting their eclectic sound and bridging genres. The band return to Nashville tonight, Feb. 10 for a performance at The Basement East with similarly-styled locals Banditos and Athens up and comers Neighbor Lady. It’s a stacked out bill and tickets are still available here, so grab yours now and read on for more about the show! Hailing from the cultural college town hub of Athens, GA (the city that gave us Neutral Milk Hotel, R.E.M., and Drive-By Truckers), Futurebirds formed nearly a decade ago, erupting onto the scene with their self-titled, self-released debut EP in 2009, before being scooped up by Autumn Tone for their full-length debut, Hampton’s Lullaby, the following year (they’ve since passed through a variety of buzzy label homes). Over the two full-lengths, most recently 2015’s Hotel Parties, a live album, Seney-Stovall, and four EPs, their latest Portico and Portico II dropping over the past two years, Futurebirds have forged a unique and eclectic sound that they’ve self-described as “psychedelic country,” combining the twang and instrumentation of traditional country music with the atmosphere, distortion, and experimental sensibilities of modern psychedelic rock, with hints of shoegaze, indie rock, and Americana. A versatile and celebrated live force, the group have become dependable festival fixtures over the years, and have shared the stage with the likes of Grace Potter, Widespread Panic, Blitzen Trapper, and more. With plenty of Nashville ties, it’s always a great time when Futurebirds pass through Music City, and whether you’re a longtime fan or just jumping on the bandwagon, this is a performance you won’t want to miss. 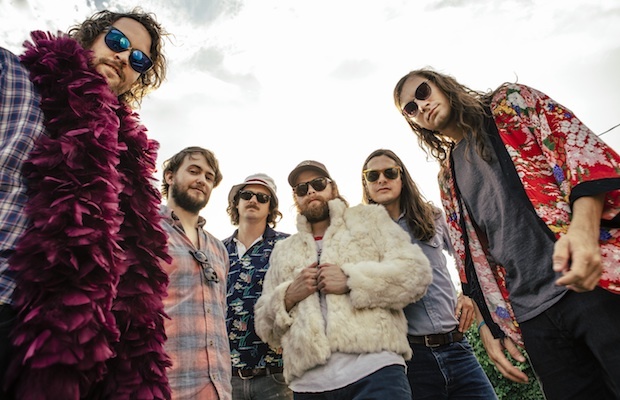 Hailing originally from Birmingham, but longtime local transplants, Banditos‘ honky tonk infused rock makes them a perfect pairing for Futurebirds’ similarly diverse style. The group formed back in 2010, originally connected through playing in their local indie rock scene, and fast became road warriors, funneling their dynamic and polished live sound into several excellent releases. Last year’s Visionland, especially, felt like the group’s most focused and full-realized effort to date, fusing their raw, garage-primed rock prowess for their rowdy country undertones and penchant for psych. We’ve been singing their praises for years, but if you’re late to the Banditos party, there’s never been a better time to get acquainted. Formed in the same musical hotbed of Athens as Futurebirds, and apparently now based in Atlanta, Neighbor Lady have been picking up buzz in the blogosphere over the last couple of years for their Americana and psych rock tinged sound, powered by soaring and enchanting vocals. There’s only a handful of songs and some live videos floating around so far, but as they prepare a full-length debut for 2018, their haunting, ethereal sound certainly has our interest piqued. Futurebirds, Banditos, and Neighbor Lady will perform tonight, Feb. 10 at The Basement East. The show is 18+, begins at 9 p.m. (doors at 8 p.m.), and tickets are available to purchase for $15.